Industry 4.0 and IIoT give the opportunity to the companies to lock and understand the true value of Data. This evolution involves merging very different technologies and computing approaches. As an example, in ­heterogeneous plants where Data integration and sensor fusion is needed to correlate continuous monitoring with production information, it is essential to be agile enough to add preprocess and normalize the information for its consumption by third party applications running in the IT world. In the OT world, information is provided by Edge devices (PLCs, CNCs, sensors) from different vendors and is presented in different formats and measures. 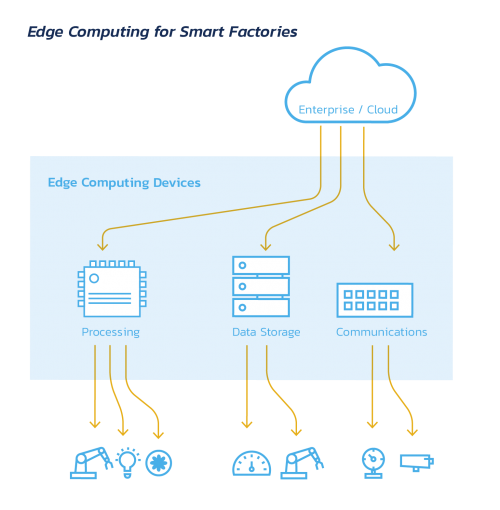 Thus, Edge computing is required for preprocessing the Data, to allow its analysis in the Enterprise and Cloud side. Therefore, the emerging scenario demands a combination of Edge, Enterprise and Cloud computing, taking into account the specific requirements of the Industry, like high-availability, real-time operation capability and security. The next generation devices and platforms that face this challenge need to be powerful from the computational point of view, and flexible enough for seamless integration of OT/IT worlds, allowing as an example software and liquid hardware microservices.